Bangkok (Thailand) – April 28, 2017 (travelindex.com) – Mrs Kobkarn Wattanavrangkul, the Minister of Tourism and Sports of Thailand made time on the sidelines of the WTTC (World Tourism Travel Council) Summit in Bangkok to meet Alain St.Ange, the former Seychelles Minister of Tourism, Civil Aviation, Ports and Marine of Seychelles who is now a Candidate for the position of Secretary General for the UNWTO (United Nations World Tourism Organisation). Former Minister St.Ange was in Thailand to push his Agenda for “Tourism for All” which he says is to live in a way that respects & enhances the freedom of others like President Nelson Mandela of South Africa said when he spoke about “To Be Free is not merely to cast off one’s chains, but to live is a way that respects & enhances the freedom of others. Alain St.Ange who launched his bid for SG of the UNWTO in January when he presented his Official Nomination Documents to Mr Taleb Rifai, the Secretary General of the UNWTO is recorded as having been the second official candidate when this was done for this UNWTO election set for 12 May on Madrid. Alain St.Ange believes in the Tourism for All platform saying that discrimination in all its form must not be tolerated in the world of tourism and has always invited the other candidates to come out and make the commitment as well. This includes the fight against discrimination based on colour of the skin, of religion, of politics, of gender, of sexual preference, of disability among others and he says that this is simply pushing an agenda of RESPECT because any form of discrimination is against our basic Human Rights. 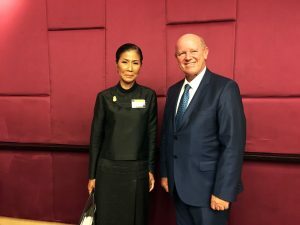 In Bangkok it was the opportunity for Alain St.Ange to table to the Minister of Thailand his Statement of Intent and discuss his vision in the presence of Mr Pongpanu Svetarundra, the Permanent Secretary in the Ministry of Tourism and Sports of Thailand. He was being accompanied at this meeting by Mr Nico Barito, the Seychelles Special Envoy of the President to ASEAN Countries and Mr Pascal Viroleau, the CEO of the Indian Ocean Vanilla Islands which comprises if the Seychelles, Mauritius, Madagascar, Comoros, Reunion and Mayotte islands. Previous to that meeting with the Thai Minister, the Seychelles Candidate to SG at the UNWTO had met Senior Officials of the Thai Ministry of Foreign Affairs where he also presented the Seychelles Agenda for Tourism for All.